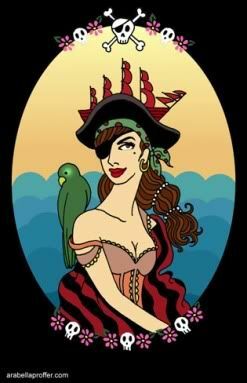 I have decided to become a Pirate Queen. Real life pirates are thieves and murderers, but on the archetypal level to be a Pirate Queen means to embrace freedom, to make one's own rules, to declare one's own sovereignty, to be bold, to joyously disregard convention, and to actively search out adventure. I have not taken leave from my own real life and I'm not going to burn my bridges unless or until I have firmly arrived on new shores. But I am going to start spicing things up, taking risks so I can reach for rewards, and caring far less about what "they" might think. This decision emerged, surprisingly, during a conversation with my new spiritual director. Inspired by my recent reading of Mama Gena's School of Womanly Arts (one of the factors in my recent healing), I had made a collage of images of pleasure. When I showed this to AA, she made it part of the altar and asked me to talk about it. Very soon, the conversation started to focus in on the images of piracy, and what they meant to me. Soon I found myself affirming that the best, most satisfying times of my life have occurred when I was somehow "outside the lines," and that true pleasure for me included freedom and not feeling constrained by what "they" thought was best/wisest/most prudent/respectable/etc. From there, it was a short step to affirming and celebrating my inner Pirate Queen, and that's when the energy started surging -- and it hasn't let up since. If I may recommend Polly and the Pirates? it's an adorable and thought provoking little graphic novel with some amazing images. I think you would like it. Thanks for the suggestion! I just ordered a used copy from Amazon.